New Crazy Invention Turns Water Into Wine? No your eyes are not deceiving you. The brilliantly crazy Miracle Machine is a new invention like no other, or so it seems. 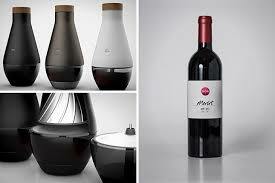 Winemakers Bob Levy and Martha McClellen have managed to come up with the first winemaking device for the home. Of course, you will need a few things before you are sitting in front of the fire knocking back the equivalent of a 1999 Cote Rotie, but hey, isn't that always the case? Trust me when I say you will want to read on. This bad boy is much more than it seems. Water into wine or wine into water? Ahhh this brings back memories of the Wine Handbag I wrote about way back yonder, and also just about how much I love wine. If only this product were the real thing, and not a publicity stunt designed to garner attention from those members of the public who are just too in love with the idea of conjuring up their own homemade wine to see past the charade. I mean come on! It has it's own video and everything. There are grape concentrates, an actual prototype, and two wine connoisseurs waxing lyrical about the inner workings of their revolutionary new invention. So what is Water into Wine all about? To asnwer that question we must first turn the idea on its head, literally. The crazy concept of turning water into wine is actually a much more humanitarian-themed concept. The charity behind this 6000 tweet-inducing idea is Wine into Water, an organization which is seeking to provide clean drinking water for those in need of, well, clean drinking water, and there are many. The founder of Wine to Water, Doc Hendley, has made it his mission to reduce the number of people dying each year from unsanitary water; a number which currently stands at 2 million. You can join his mission by clicking here and by speading this article across the internet as if it were your favorite jam, and the internet you trusty slice of toast. 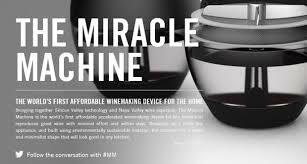 With thousands of people flocking to the Miracle Machine website, the minds behind the Wine into Water charity are hoping to bring clean drinking water to the countless needy people accross the world. Is it a bit weird that they are indirectly comparing themselves to Jesus? Most certainly. But we can also certainly forgive them if the ingenuity behind this marketing stunt is a sign of their determination to draw attention to their cause. In conclusion, what a marketing tactic; a miracle winemaking machine which everyone talks, tweets and raves about, and then the discovery that it is fake which has, most likely, generated even more publicity. Conclusion? Marketing hoax/trick/stunt, but with a far less selfish goal than usual. Check it out!